While the use of color has been fully embraced and normalized in area scan systems, line scan systems have been slower to keep up. However, in the last several years, and especially into 2017, user demand for color in line scan has helped to ensure that these cameras occupy a significant position in the market. It’s not a surprising shift; users want color and the workarounds—such as using three cameras with three colors of lights—can be cumbersome and costly. And once again, the affordability of CMOS imager technology facilitated the advance, making color imaging more feasible. In fact, before the inclusion of CMOS in line scan cameras, even customers willing to pay whatever it took to purchase a color line scan camera couldn’t find a solution or, if something was available even for a high price, it likely didn’t operate fast enough to make the investment worthwhile. Generating color images requires three data points for each pixel and achieving this at each pixel location requires high-speed processing; CMOS is ideally suited to these higher speeds. At the same time, CMOS allows for sensor architectures with closer line spacing, which is critical to reducing distortion in line scan imaging. 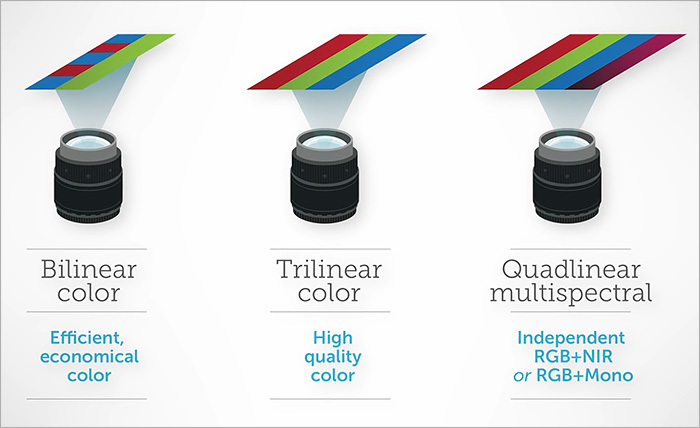 A color line scan camera operates as if it is three cameras in one, with one “camera” for each red (R), green (G), and blue (B) line. For optimal imaging, these lines must be very close together. Many applications which can benefit from color inspection have adopted tri-linear technology, which uses three linear arrays fabricated on a silicon die—one each for R, G, and B channels. There are cameras on the market today that leverage trilinear CMOS sensors and provide these three native colors (R, G, and B) with minimal separation to maximize accuracy; in some cases, these cameras can perform at very high speeds with a line rate of up to 70 kHz. Another band of color providing additional benefits in machine vision line scan systems is near infrared (NIR), which is invisible to the eye and found just on the other side of red. Today’s quad linear, or multilinear, cameras provide the three native colors (R, G, and B) as well as a NIR channel, which can be used to reveal defects that can’t be detected with “traditional” light. 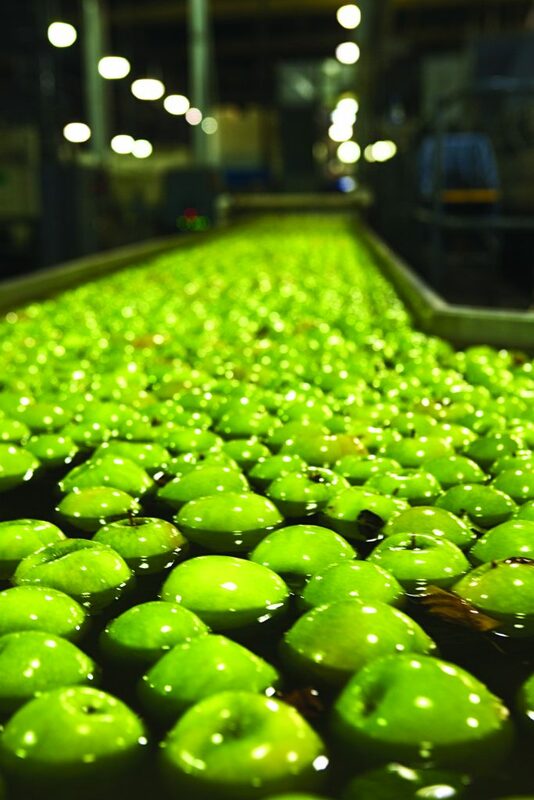 One common application for quadlinear color line scan is fruit inspection. When an apple is bruised, it can take some time for the peel to appear brown even when the fruit is discoloring below the surface. With NIR, the surface damage from the bruise that is invisible to the naked eye—and that can’t be seen with R, G, or B color—is immediately clear, so producers can quickly identify and remove seriously damaged fruit. This capability is commercially available off the shelf in high-speed, quad linear cameras today, for a reasonable price. Our next post in the series will explore the advances made in time delay integration (TDI). Stay tuned!